I have yet to meet a shortbread I didn't like and this Chocolate Nut Shortbread is no exception. 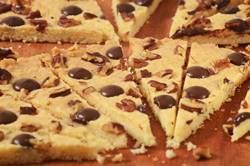 It is a delicious combination of buttery shortbread topped with chunks of toasted nuts and chocolate. The great thing about shortbread is that it is simple to make, and while using an electric or hand mixer makes quick work of this process, you can just as easily mix the ingredients by hand in a large bowl with a wooden spoon. One noticeable difference with this recipe is that it is formed into a round, without the use of a tart or cake pan, giving the edges of the shortbread a rough and casual look. 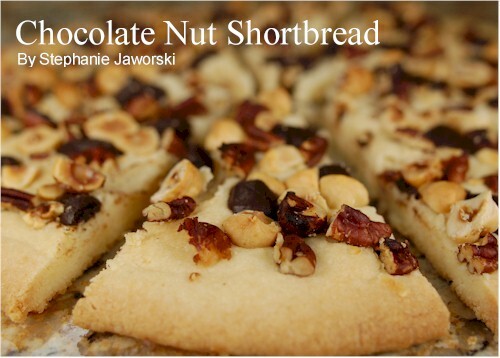 Chopped toasted nuts along with pieces of chocolate (or chocolate chips) are then pressed into the shortbread. You can use a single nut or a combination (hazelnuts, pecans, walnuts, almonds, or pine nuts) and the chocolate can be semisweet, bittersweet, milk, or white. The secret to making good shortbread is to use a high quality butter and pure vanilla extract. While I have mentioned the following information under the Shortbread Cookie recipe I think it bares repeating here. Butter in the States is graded according to flavor, color, texture, aroma and body and one easy way to tell the quality of the butter is by the letter code or numerical number listed on the butter's package. The highest grade is AA (93 score), then A (92 score), followed by B (90 score). Buying vanilla extract can also be a challenge as there are so many choices. The first thing to do is to make sure that it is labeled "pure". The best I have found, although it is quite expensive, is Nielsen-Massey Madagascar Bourbon Pure Vanilla Extract that can be found in specialty food stores and by mail order. If your budget doesn't allow this expenditure or you cannot find it, don't worry, there are quality brands to be found in your local grocery store. Just stay away from the ones labeled "imitation" vanilla extracts as they are made with synthetic vanilla (from glycoside found in the sapwood of certain conifers or from coal extracts) and leave a bitter aftertaste. Chocolate Nut Shortbread: Preheat oven to 375 degrees F (190 degrees C) with the rack in the middle of the oven. Have ready a baking sheet that is either buttered or lined with parchment paper. In the bowl of your electric mixer (or with a hand mixer), beat the butter and sugar until smooth (about 2 minutes). Beat in the vanilla extract. In a separate bowl whisk together the all purpose flour, rice flour, and salt. Add this mixture to the butter and sugar mixture and beat just until incorporated.